To celebrate International Women’s Day, LoveKnitting is proud to support Women for Women International in their incredible #MessageToMySister campaign. In honor of the occasion we’ve collaborated with independent designers to curate an EXCLUSIVE collection of gorgeous patterns where 100% of profits will go to this trailblazing charity! While International Women’s Day celebrates the outstanding achievements of women around the world, the event is also a call to action to continue to strive for parity and social justice for women survivors of war in conflict affected communities around the world. With unprecedented levels of violence against women and hard-fought rights under threat in many parts of the world, it has never been a greater time to show solidarity with women survivors of war. Women for Women International recognises the powerful and transformative effect of sisterhood. In their work, they see how authentic connections and relationships can actively restore and empower individual lives, helping to raise women out of poverty and give them new hope and opportunity. When a woman joins the Women for Women International year-long programme, she joins together with 24 other women, forming a tight support group that helps to break the isolation caused by war and insecurity. She also learns a marketable job skill – such as tailoring, bread-making or poultry-keeping, as well as business training to turn her chosen skill into a stable income so she can support herself and her family. Reem, Syrian refugee and Women for Women International programme graduate, Kurdistan Region of Iraq. The knitting community has always proudly stood at the forefront of social justice and community outreach. 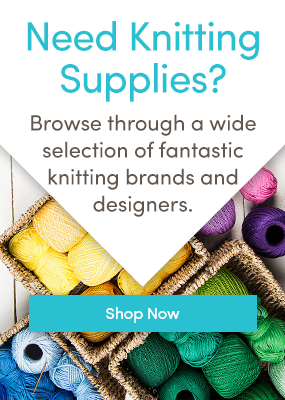 Which is why LoveKnitting is proud to bring you an exclusive collection of knitting patterns by inspiring female designers in support of Women for Women International. It’s never been a better time to stitch for sisterhood! The #MessageToMySister campaign invites everyone to write messages of support and encouragement to women in communities affected by conflict. Women for Women International is asking each of us to reach out and make a difference by telling the women in their programmes that they’re not alone and that we’re standing alongside them. International Women’s day gives us the opportunity to bring attention to pioneering female designers, who bring ingenuity, passion and innovation to our favorite craft. Perfect for women on the go! Featuring a distinct an intricate cable design, this gorgeous Mamie Taylor pattern by Thea Colman, is wonderful for intermediate knitters looking for a quick and satisfying project. A classic and beautiful design, which echoes the strength and elegance of women through the generations! This Afternoon Tea Sweater pattern by Sarah Hatton is a pure delight to knit and modernises a vintage style for a new generation of empowered women! We’re delighted to see these gorgeous hats from Kiyomi Burgin feature in this special collection. Why not pair up with a friend or knit for an inspirational woman in your world? Champion the Burgin sisters by exploring more of their beautiful designs! Explore the whole collection of Women for Women International patterns here! And don’t forget to share with us your progress in the comments below! To find out more about the #MessagetoMySister campaign and how you can get involved this International Women’s Day click here! You can also follow Women for Women International on Instagram and their website. Last updated: March 7th, 2018. “Once I was no longer in MK, I was an outcast and lied about. This occurs over and over in MK and other MLMs. They hook you with the promise of “sisterhood. Business (real business) and sisterhood don”t mix. If you want sisterhood, join a convent. Men in business can be gentlemen and deal with one another with respect but, at the end of the day, they know it”s still business. It”s not “brotherhood.